The Baie de Seine is the second ship in Brittany Ferries no frills ‘économie’ fleet and offers a simple yet extremely comfortable service. Formerly with DFDS as the Sirena Seaways, the Baie de Seine has a passenger capacity of 610 and availability for more than 200 vehicles. Onboard you’ll find a self-service restaurant with limited choice, a small bar and café, boutique, limited seating, a range of en-suite cabins, free Wi-Fi internet access and children’s play area. There is vast array of cabin choice available onboard, with the Baine de Seine offering 2,3 and 4 berth inside and outside cabins all of which are equipped with ensuite facilities and are air conditioned. Cots are available on request. Disabled cabins are also available. A self-service restaurant can be located on Deck 8 which offers a selection of tasty hot and cold food as well as snacks and deserts. 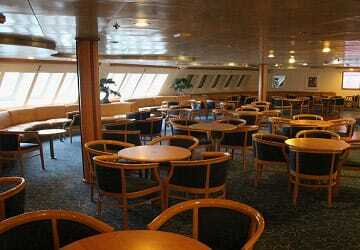 If you would prefer to just have a relaxing beverage there is a Bar overlooking the ships bow offering a range of beers, French wines, soft drinks and light snacks or there is a café on the deck below. The boutique offers passengers a chance to purchase gifts for themselves or others. You can pick up items such as spirits, wine, tobacco, perfume and cosmetics plus much more for very reasonable prices. The ship is wheelchair friendly with disabled parking available close to passenger lifts as well as specially fitted cabins. Please contact the operator prior to your departure if you need these services. Please Note: Whilst we have taken great care in making our Baie de Seine guide as accurate as possible, onboard facilities, services and entertainment may vary depending on the date and time of year that you travel, facilities mentioned may change without notification and ferry companies reserve the right to operate vessels other than those mentioned at time of booking without prior notification. We enjoyed our ferry return trip from Bilboa to Portsmouth with Brittany Ferries. The staff were very helpful and friendly. We were pleasantly surprised with the cabin size and it had a good ensuite, great value for money. We enjoyed the meals we had in the restaurant. Overall very good. We would definitely use this company again. 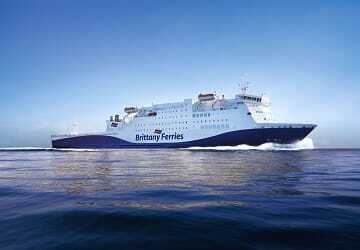 We booked with Direct Ferries, again a very good company to deal with. All was well, the cabin was clean, bit of a stain on the bed quilt as it ruffled out of the cover was not so pleasant. But generally was very pleased with the service. I think it is a bit of a rip off now asking for more money for having a bike on the back of the car. "Journey from Bilbao to Portsmouth"
Overall the experience was very pleasant. The ferry journey represented good value for money. 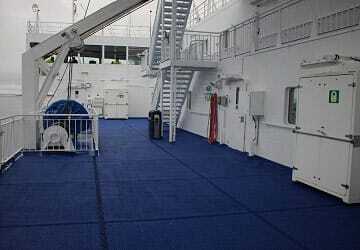 The facilities including the 2 berth cabin were excellent. Food served in the restaurant was very good. The staff were professional, helpful , courteous and efficient at all times. The boarding and disembarkation all though time consuming was probably as good as it could be in all the circumstances. I would recommend this ferry without reservation. A nice ship with a friendly and professional crew. We had a good trip on the ferry. 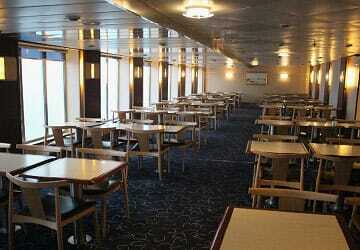 The cabin was nice and clean, there was a good choice of food and drink, although the prices are a bit expensive. No complaints at all.